Important Anouncement: The Mara Predator Project has now completed field activities and is now in the process of analysing data to inform conservation practices. The project was instigated and developed to provide conservation research on one of East Africa's most important lion populations and we are now able to provide evidence-based advice regarding on successfully maintaining viable lion populations in the region. We would like to thank all of those who participated in the research including all of the lodges, managers and guides who made this work possible. We would also like to express our gratitude to our funders and supporters. This website will stay active to retain the historical information of our study lions. If you saw lions within our study area from 2008-2013, and possibly dates either side of this period, we still welcome you to browse our profiles and identify you lion. 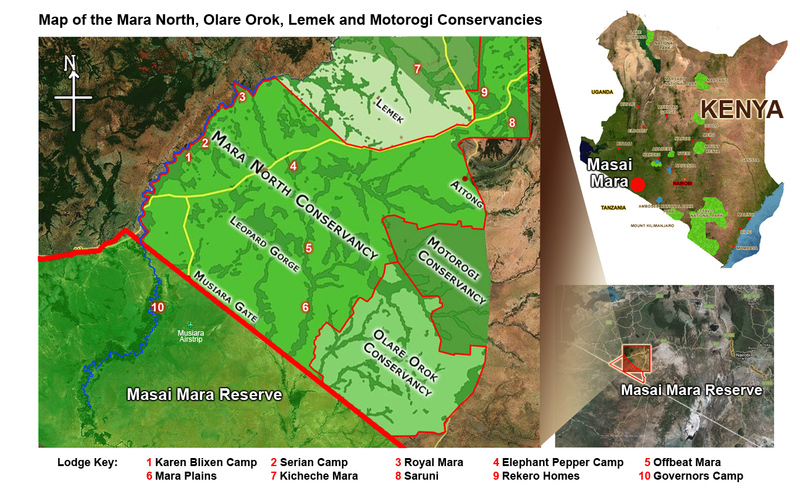 The Olare Orok Conservancy (OOC), and Mara Naibosho Conservancy lie along the northern border of the Maasai Mara Reserve. Owned by the local Maasai, the area is rich in wildlife and is visited by thousands of tourists each year, hoping to see the Big Five and the annual wildebeest migration. However, much of the area is also used for grazing cattle, meaning that lions are at risk from conflict with livestock owners. As cattle numbers and human encroachment increase, so does the threat to the lions here. The Mara Predator Project is monitoring lions within the Northern Masai Mara conservancies with the help of lodge guides and visitors, who report sightings to us. 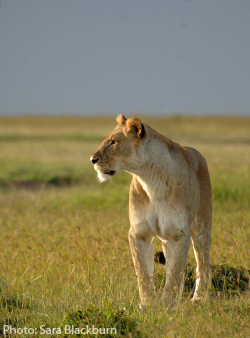 Within Mara Naboisho Conservancy, we work alongside the Mara Naboisho Lion Project and African Impact. We have built an online database of all lions in the region, allowing visitors to identify the individuals they see. This information allows us to map their home ranges, monitor reproduction and identify long term population trends, essential baseline data for all conservation efforts. The project began with the help of Alex Walker of Serian Camp, where the project began. We are now relocating to the Olare Orok Conservancy to conduct monitoring within that region. How do we identify lions? In the Mara region, we do not use radio collaring, as most lions are accustomed to vehicles and are frequently photographed by visitors. Each lion’s whisker spot pattern is unique and remains the same throughout its life, providing an accurate means of identification. We also use ear tears, nose colour and mane size, but these can change. Lion conservation is not only an issue for researchers, but for everyone who has a passion for big cats. All visitors are welcome to become involved in our work. Involving tourists is key to our success. The project has an online database, which can be used to search for lions by their key characteristics. Each lion has its own profile, with photos, history statistics, pride mates and sighting information. 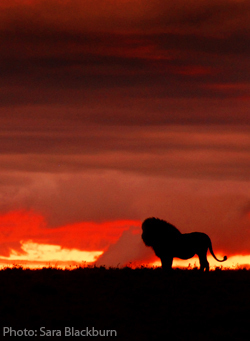 Have you have photographed a lion in or around the Mara North, Olare Orok or Naibosho Conservancies? It is easy to report your sighting, along with a photograph by using the report form. 1. Choose a photograph of your lion that shows identifying features, preferably the whisker spots. 2. 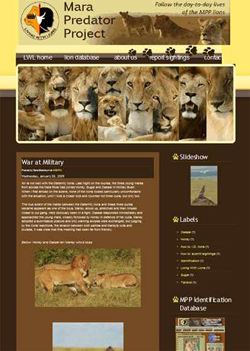 Go to the lion database and enter the lion's features in the left-hand column. Read our 'identify lions' guide if you're unsure how to use this feature. This will search the database for possible matches. 3. 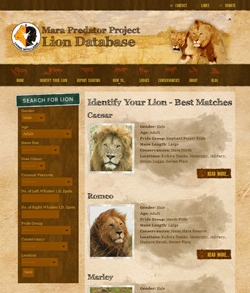 Browse the resulting lion profile, using the images and identification sheets to try and identify your lion. 4. If you think you've identified your lion, complete the report form so that we can confirm the sighting. If possible, send us your photos (which are used only for lion monitoring, never commercially). If you'd like to join our mailing list, please check the box and enter your email address. Alternatively, if you would like to email us any recent photographs of lions, we can identify them for you. Follow the lives of our study lions through our blog! There’s always something going on with our big cats. You can read about the day-to-day lives of our study lions at marapredatorproject.blogspot.com, which is updated regularly with news and stories on our most popular lion stars. Here, past safari-goers or anyone interested in the project can follow their favourite lions, and keep up to date on the project’s progress. The project is in need of funding to continue this research. Your donations will go towards many different aspects, from helping to reduce conflicts with predators to lion monitoring. If you can make a donation to the project please visit our donation page to find out how. Donations are tax deductible. We are in need of good quality cameras for our monitoring guides. If you have recently upgraded your camera and would like to donate your old one, please email us to find out how. The Mara Predator Project would like to thank Serian Camp and the participating member camps of the region, Panthera and the Banovich Wildscapes Foundation, without whom this project would not be possible.